Affordable weekly, fortnightly or monthly instalments. You can choose from 3 affordable hampers. The instalment is debited from your nominated credit card or debit credit card. You hamper will be delivered to your door in late November early December. * All photos are for illustration purposes only. Actual product may vary due to availability of stock. A once-off set up fee of $5.50 will be charged on initial receipt of your application. You are able to order a product for yourself or someone else as a gift. The hampers are available via a payment plan, no interest charges, no credit traps. All the orders are delivered to you once a year before Christmas. You can add extra hampers throughout the year. You can pay weekly, fortnightly or monthly. A once off administration fee of $5.50 will be charged to you on receipt of your application. Select the Hamper you would like to purchase. Click the “Add to Order” Button corresponding to the product you would like to purchase. Items will be added to your shopping cart which will automatically update to show the current total. When you have added everything you would like to order, click on “Checkout” and follow the simple instructions that lead you through the ordering process. It’s that easy! Please Note: In most delivery locations, the price of products includes collecting your payments (charged to us by our bank) and delivery (If you live on the islands in the Redland Bay region you will be charged extra – if delivery is required) – please see Terms and Conditions of Purchase. You can download a Hamper Order Form and scan and email it to info@redlandcommunitycentre.org or post it to PO Box 337, Capalaba Qld 4157. WHERE DO I DOWNLOAD A PDF VERSION OF THE HAPPY HAMPER ORDER FORM? You can download a PDF version of the Happy Hamper Order Form from here. Cross the relevant box and write your Membership Number if you have one. Complete your personal address details. Complete the delivery address details if different from the mailing address. Please provide any special delivery instructions (ie: the lot number / leave with neighbour / call before delivery etc). Please provide at least 2 forms of contact details and please include an email address AND telephone number. Write the details of the hampers that you want: Hamper Description, Quantity and Price. Total up your order and write the total amount in the box provided. Cross the box on page 2. Then turn to the Gift Order Form on page 3 to complete the receiver’s address details and the message you would like to include. You will need to complete a separate order form for each gift recipient. Print and sign your name and fill in the date. Choose your payment start date, payment frequency and payment date. By Direct Debit of your Credit Card or Debit Credit Card. (Not your EFTPOS Card). Yes. If you can cancel your order within 21 days of the date of the original order confirmation you will not be charged a cancellation fee. Please see our Cancellation Policy for more information. We do charge a once-off $5.50 administration charge on initial receipt of your application. You can change your bank account details by logging on to your Charegebee Account Portal or alternatively you can download the PDF version of the Change of Direct Debit Details Form and scan and email, or post it to us. WHERE DO I DOWNLOAD THE CHANGE OF DIRECT DEBIT DETAILS FORM? You can download the PDF version of the Change of Direct Debit Details Form here. CAN I STOP A DIRECT DEBIT PAYMENT? Yes, if you call us by midday the working day before your payment is due we can stop a payment (i.e. before Friday midday for a Monday payment). We’ll automatically recalculate and slightly increase your future payments so that your order is fully paid by Friday, 29 November 2019. WILL I BE CHARGED IF I MISS A PAYMENT? Your bank, Credit Union or Building Society may charge you a fee. Redland Community Centre will charge you a small dishonour fee of $5.50 to cover charges we incur. WHAT HAPPENS IF I CAN’T KEEP UP MY PAYMENTS? We understand that circumstances change and if you are not able to keep paying, please call one of our friendly Customer Service team to discuss your options on 07 3245 2117. If you miss more than 2 consecutive payments we reserve the right to cancel your Hamper Order. Please see the Cancellation Policy for more information. WHAT HAPPENS TO MY PAYMENTS ON PUBLIC HOLIDAYS? Your Direct Debit payment will come out the next working day. Please note that Redland Community Centre is located in Brisbane, therefore we observe all QLD holidays. If you wish to skip a payment on a public holiday, or on the day after, you will need to let us know before midday on the working day prior. You may cancel your order at any time prior to the delivery of goods. If you cancel your order within 21 days of the date of your original order confirmation (Cooling Off Period), there will be no cancellation fee. If you miss than more than 2 consecutive payments, we may elect to cancel your Hamper Order. CAN I ORDER PRODUCTS AS A GIFT FOR SOMEONE ELSE? Yes. You’ll need to place your online gift order separately from your own order. When you do, simply let us know that it’s a gift and during the checkout process we will request the gift delivery address. We won’t write to the recipient so it will remain a surprise. Yes, you can change your order any time until the Last Change Date (this does not include cancellations; refer to the table below for dates). Just remember that changing your order can lead to an increase or decrease in your payments. This does not include cancellations; please refer to our cancellation policy in the Terms and Conditions of Purchase for full details. You can expect to receive an order confirmation within 5 working days. Please check all your details carefully as this is what we have on record for you. If any of the details are incorrect please Contact Us immediately and we will make the necessary changes. If you do not receive an order confirmation, please Contact Us. CAN I ORDER AT ANYTIME DURING THE YEAR? No. We take orders up until the 1 February, 2019 for the Christmas Hamper. WHERE DO YOU DELIVER TO AND WHEN WILL THEY ARRIVE? All deliveries are made from mid-November to mid-December. We will contact you closer to your delivery time with your delivery details. Due to the nature of frozen goods customers must be home to accept delivery on the day advised, or make arrangements with friends or neighbours to accept it for you. We recommend you put frozen hampers into the freezer as soon as you receive them. Your hamper orders will arrive between 7am and 7pm on your scheduled delivery date. Unfortunately, Redland Community Centre cannot provide you with a specific time. Please note if your Hampers do not contain frozen goods they may be left at your premises if our courier considers it safe to leave. 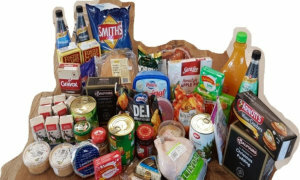 If will not be home on the day of delivery then you can also opt to collect the hamper from IGA Marketplace Cleveland, Cnr Shore Street West and Old Cleveland Road, Cleveland. Please contact Redland Community Centre on 07 3245 2117 if you wish to collect your Hamper from IGA Marketplace Cleveland. 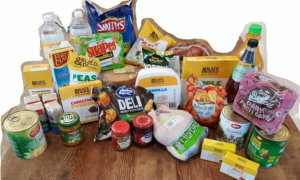 Should you live on one of the islands inside of the Redland City Council area, we may ask you to collect your Hamper from IGA Marketplace Cleveland, Cnr Shore Street West and Old Cleveland Road, Cleveland. While every effort is made to deliver on the date advised, Redland Community Centre cannot accept liability for delay due to the customer’s failure to complete customer obligations or any other reason beyond the control of Redland Community Centre (and/or its staff). Redland Community Centre cannot accept any liability resulting from a contracted party’s failure to deliver on the date advised. Should your delivery address change, please inform Redland Community Centre immediately. Deliveries to islands may incur an on-forwarding freight charge . If a delivery address is changed after the 1 September, Redland Community Centre reserves the right to charge a redelivery fee. If you change your address, simply Contact Us to let us know as soon as possible. If a delivery address is changed after 1 September , Redland Community Centre may charge an administration fee of $5.50. When placing a Hamper order with Redland Community Services, you are agreeing to the following Terms and Conditions. Once you have placed your order, payments via Direct Debit will start on the date you selected. Your Direct Debit payment will come out the working day prior to the public holiday. Please note that Redland Community Centre is located in Brisbane, therefore we observe all QLD public holidays. If you wish to skip a payment that would land on a public holiday, you will need to let us know before Mid-day on the working day prior. Example: Australia Day 2019 observed on Monday 28th January 2019. Therefore, a payment due on that date would be taken on Friday 25th January 2019. If you needed to skip that payment you would let us know by midday Thursday 24th January 2019.
cancel your subscription outside of the Cooling Off Period (for more information click here). Adding to, or altering your order may also change the total amount you will need to pay. If you miss a payment we will automatically recalculate and slightly increase your future payments so that your order is fully paid by the Final Payment Date. If several payments are missed, we will reduce your order to make the remaining payments easier. We reserve the right to reduce or cancel your payments should your plan fall too far behind. We are not responsible for your bank charges if payments fail. We will charge an administration fee of $5.50 if a payment fails. If you are unable to keep paying, we will reduce your order to the amount you have already paid, and you will still receive products and/or vouchers for Christmas. We are happy to discuss your order at any time. Simply Contact Us. If you call us on 07 3124 0264 by midday the working day before your payment is due, we can stop a payment (i.e. : before Friday midday for a Monday payment). Just remember that changing your order can lead to an increase or decrease in your payments. A customer service representative will be more than happy to help you out. To contact us, click here or email us at info@redlandcommunitycentre.org. If you require a change to be made to your order after 1 September, Redland Community Centre reserves the right to charge you an administration fee of $5.50. Should there be a product change, an appropriate substitution, of comparable value may be made. All prices are inclusive of GST, tax and/or duty where applicable. Should there be any alteration in rates of GST, tax or duty, or any unforeseen product or fuel price increases, Redland Community Centre reserves the right to substitute or adjust hamper contents accordingly to cover the increase. A once-off administration fee of $5.50 will be charged on initial receipt of your Hamper application. All deliveries are made from mid-November to mid-December, unless stipulated otherwise. We will contact you closer to your delivery time with your delivery details. If you order multiple items, you may receive your items over multiple days. Please note if your Hampers do not contain frozen goods they may be left at your premises if our Courier considers it safe to leave. While every effort is made to deliver as advised, Redland Community Centre cannot accept any liability for delay due to the customer’s failure to complete customer obligations or any other reason beyond the control of Redland Community Centre (and/or its staff). Redland Community Centre does not accept any liability resulting from a contracted party’s failure to deliver as advised. Deliveries to islands may incur an on-forwarding freight charge. Should your delivery address change, please inform Redland Community Centre immediately. If a delivery address is changed after the 1 September, Redland Community Centre reserves the right to charge an administration fee of $5.50. Due to the nature of frozen goods, customers must be home to accept delivery on the day advised or make arrangements with friends or neighbours to accept it for you. We recommend you put frozen products into your freezer as soon as you receive them. If you will not be home on the day of delivery then you can also opt to collect the Hamper from IGA Marketplace Cleveland, Cnr Shore Street West and Old Cleveland Road, Cleveland. Please contact Redland Community Centre on 07 3245 2117 if you wish to collect your Hamper from IGA Marketplace Cleveland. 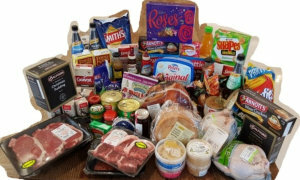 Should you live on one of the islands inside of the Redland City Council area, we may ask you to collect your hamper from IGA Marketplace Cleveland, Cnr Shore Street West and Old Cleveland Road, Cleveland. If we deliver to the islands, we will charge an extra delivery fee. Should your delivery address change, please inform Redland Community Centre immediately. If a delivery address is changed after 1 September, Redland Community Centre reserves the right to charge an administration fee of $5.50. We will gladly replace items or reimburse you should a product be damaged in transit and in accordance with our legal responsibilities as a merchant (we’ll make sure you are happy with your order in time for Christmas). We are unable to accept returns for other reasons such as if you have changed your mind or have made an incorrect choice about the product and no longer wish to keep it. We only use brands you know and trust. This ensures they’re all top quality. And, we only deal with suppliers who have an established track record of the very highest quality. While we make every effort to supply you with your products, stock and suppliers may change. Redland Community Centre reserves the right, to make substitutions of any products. When this is necessary, we’ll ensure that they’re of equal or greater retail value. We reserve the right to deduct a $5.50 administration fee per annum from any credit balance on an inactive account. General information regarding the details of the direct debit arrangements (DDA) between Redland Community Centre and the customer are contained in Section 8. Payment Details of this Order Form. Redland Community Centre will give notice to the Customer if it proposes to vary any of the DDA’s. In the event of a customer requesting deferment, or alteration to the DDA, such request must be made to Redland Community Centre by telephone by midday 1 business day before the proposed DDA is executed. Any requests to stop a DDA or temporarily cancel a DDA should be made direct to Redland Community Centre in the first instance. Redland Community Centre will then make the necessary adjustments to the DDA arrangement. In the event of a dispute by a customer in relation to the DDA, the dispute must be made, in the first instance directly to Redland Community Centre. Redland Community Centre will then respond to a request in writing within 10 business days. Redland Community Centre will then make the necessary adjustments or take the necessary action to rectify the situation. If the above parties cannot resolve the dispute, the customer reserves the right to escalate the dispute to their Financial Institution. The customer is advised to check account details against a recent bank statement to ascertain if the bank account is available for direct debits. If uncertain, it is advisable to check with the Financial Institution before completing the DDA. It is the responsibility of the customer to have sufficient clear funds available in the relevant account by the due date to permit the payment of debt items initiated in accordance with the DDA. In the event that a DDA payment falls on a day, which is not a business day across Australia, the DDA will be processed on the next business day. If it is not a business day in the place of lodgement, but a business day elsewhere, the DDA will be processed on that day. If the customer is unsure as to when the debit will be processed to the nominated account, they should enquire direct to their Financial Institution. When a DDA item is returned as unpaid to Redland Community Centre by a Financial Institution, the fees incurred by Redland Community Centre will be borne by the Customer. Redland Community Centre will not attempt to access a customer’s account again under the provisions of the DDA until such time as there is notification to the customer as to the next DDA attempt. Redland Community Centre will not divulge any information to any external parties regarding a customer’s records and account details without the customer’s prior written consent. However, the Bank may require such information to be provided in connection with a claim made on it relating to an incorrect or wrongful debt. There will be no contract between Redland Community Centre and a customer until Redland Community Centre issues a notice confirming the customer’s order. Each contract is governed by the law of the state or territory in which the customer resides except for residents of the ACT whose contracts will be governed by the law of NSW.